Whether a power bank can board an aircraft depends on the capacity in Wh (Watt hours). Most commercial power banks, however, have the right capacity to be allowed on board an aircraft if you have indicated this to security. According to the IATA guidelines, power banks with a capacity below 100 Wh (multiply Ah x Volt to get Whg) are allowed. You can carry loose batteries in your hand luggage as much as you want, but not in the cargo hold. You can also bring between 100 and 160 Wh but you are limited to a number of 2 batteries. You also need to register these batteries when you check in your luggage. 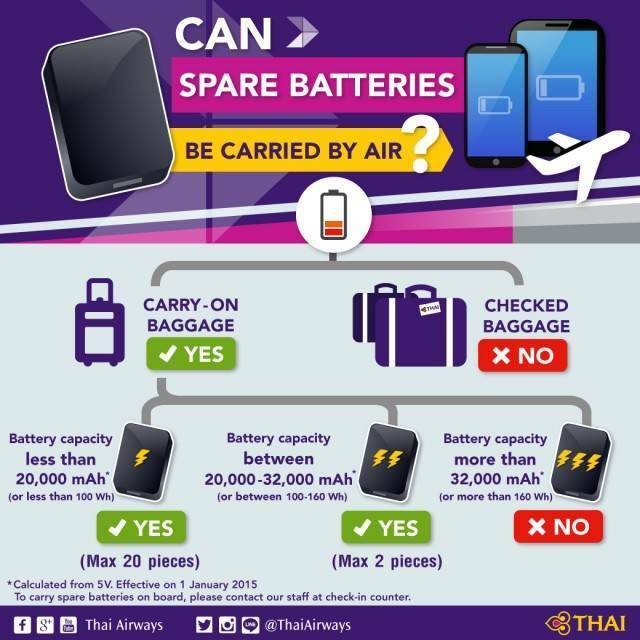 All spare batteries and power banks above 160 Wh must be declared and placed in the cargo hold under the ‘Dangerous Goods’. Powerbanks and spare batteries under 100 Wh are allowed on board when indicated at the check-in desk. However, each airline sets its own rules for allowing external batteries and power banks. Always read the regulations of the airline with which you fly. Every airline and transport company has a manual that points to the allowance of spare batteries and power banks. Removable batteries must be taken along in the hand luggage under the regulations that you see below in the overview. If you prefer to take batteries or a power bank in your checked baggage, keep in mind that there are rules for the maximum amount of Lithium-ion batteries. Some manufacturers already take this into account when producing batteries. 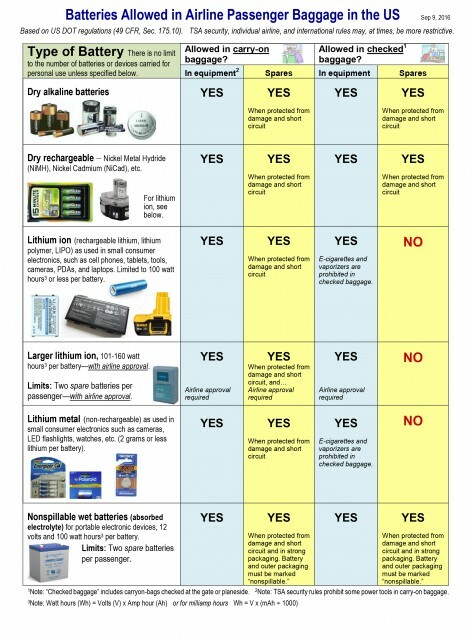 Overview of authorized batteries in the United States. 1. The power bank is for personal use. 2. The power bank must be taken along in the hand luggage. 3. It is not allowed to take a power bank with you in the checked baggage. 4. Powerbanks with a capacity of under 100 Wh may be taken on board without permission. 5. Powerbanks with a capacity between 100 and 160 Wh may be taken on board with permission. 6. It is not allowed to bring power banks with a capacity of 160 Wh or higher. 7. Powerbanks must be switched off for the entire flight. How do I calculate if my power bank is allowed on board?